Grimes Chiropractic in Tahlequah Oklahoma specializes in many chiropractic services from minor injuries to aches and pains to overall health & wellness. 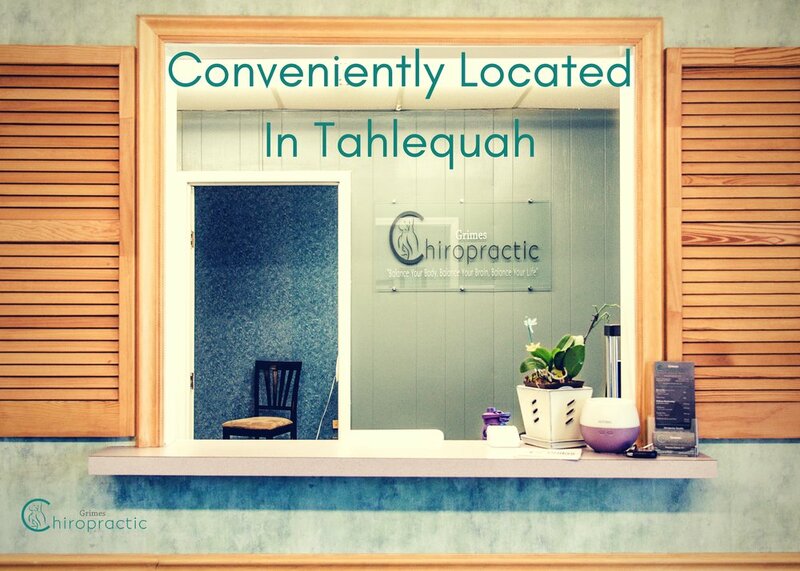 For a top rated chiropractor in the Tahlequah area, look no further than our flexible payment office in town. Located in the heart of Tahlequah Oklahoma, Grimes Chiropractic has been serving green country for nearly 15 years with quality small town care. We specialize in a functional approach, which allows us to integrate cutting edge knowledge of how the nervous system and other parts of the body work together to create good health. Our office exists to help heal and educate our community to reach health care goals, increase quality of life, and optimize wellness. With so many different opinions, styles and methods out there, the difference with Grimes Chiropractic is that we know that everyone is unique, with their own individual needs and goals. We work with our clients to create individualized treatment plans, based on their needs, to reach their health goals as quickly and efficiently as possible. While we help many people with injuries and other problems, we understand that health is more than being symptom free. We take a functional approach to care, which allows us to integrate cutting edge knowledge of how the nervous system (brain) and other systems work together to promote good health. By taking a functional approach to care, we are better able to customize and tailor care, to help with injuries, other health issues, as well as pursuing wellness goals. We understand that finding quality care can be difficult. We know it is even more difficult to find quality care at affordable pricing. We know that quality healthcare can be affordable. So, instead of just complaining about the system we are creating and providing solutions to meet your specific needs. In addition to Pay As You Go care, we also offer a remarkable Wellness Membership to help control and minimize out of pocket costs for our clients who want to make more long term investments in their health. We help by taking time to listen to you, and to discuss your individual history and activities, so that we can pinpoint the best strategy for getting you back to feeling great again. The customer experience is the most important factor to chiropractors like us. We view our relationship with our clients as a partnership and treat each patient with the kindness and consideration we would give our own families, and that's the way it should be. We want our clients to have a positive, comfortable, and friendly experience from the moment they first step through our door. I'm always greeted by smiling, kind, caring faces as I walk through the door. I've never met anyone as sweet, happy, love filled or as positively uplifting as the two of. Thank you for choosing the chiropractic profession and performing the miracles you do!! Shannon has improved my health so much! Hands down the BEST chiropractor I've ever been to. His approach is very thorough and precise, with extensive knowledge in many different health areas. Amazing doctor right here in Tahlequah!! Stop in and see how he can help you too!! Shannon Grimes has helped me with my overall health when doctors and specialists failed me. When gravely ill he is the one that helped me figure out have gluten allergy. Totally changed my life. Now battling trigeminal neuralgia and once again when neurologists cancelled Shannon Grimes comes through and gets me back to work. Thank you Shannon for your caring compassion. My husband and I drove from Skiatook to see Dr. Grimes. It was well worth the drive to be treated by such a skilled, trustworthy, professional who genuinely cares about the well being of his patients. My husband is free of pain and his back fully functioning again. The fees are very reasonable too. Thanks Shannon!